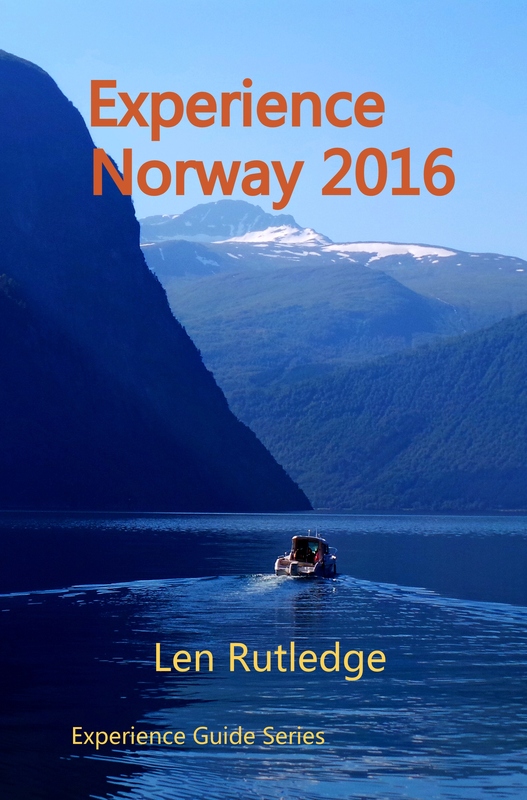 The 2017 edition of Experience Norway is now available as an ebook or paperback. 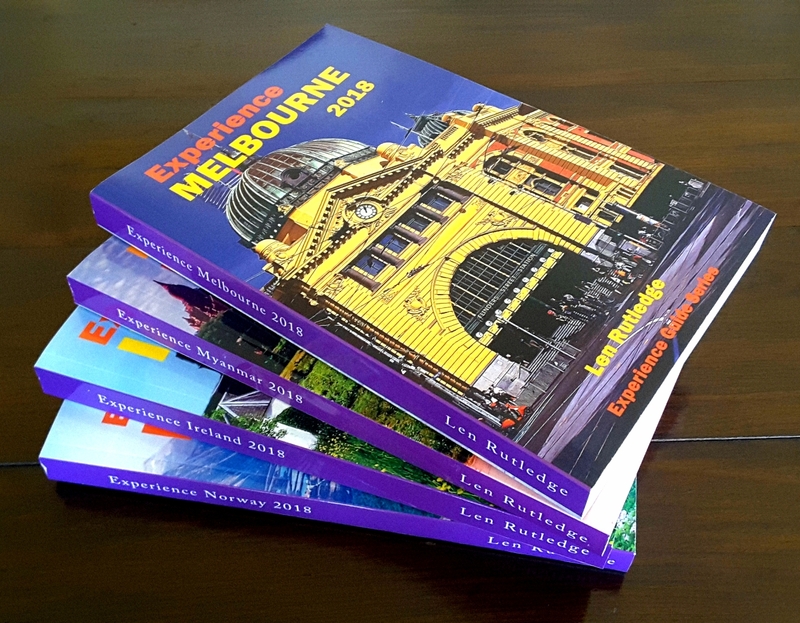 This is consistently one of the best sellers in the Experience Guide series so check it out on http://www.amazon.com/dp/B06X6HYDF8. You can read the first section on this site without buying anything. 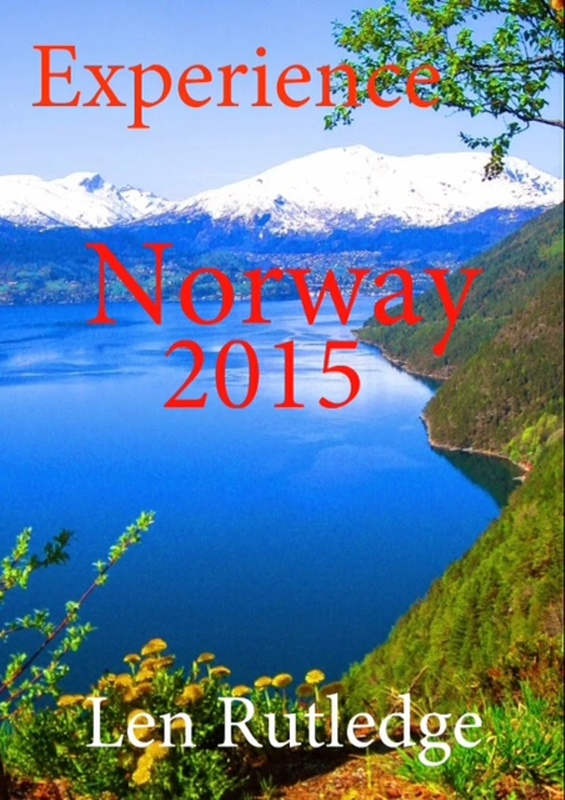 A new edition of Experience Norway is now available in hard copy and as an e-book. Please go to http://www.amazon.com/dp/B01A2PHMQM to check it out. Experience Norway has consistently been one of the best sellers in the Experience Guide series and now we have a much expanded and improved 2015 edition. 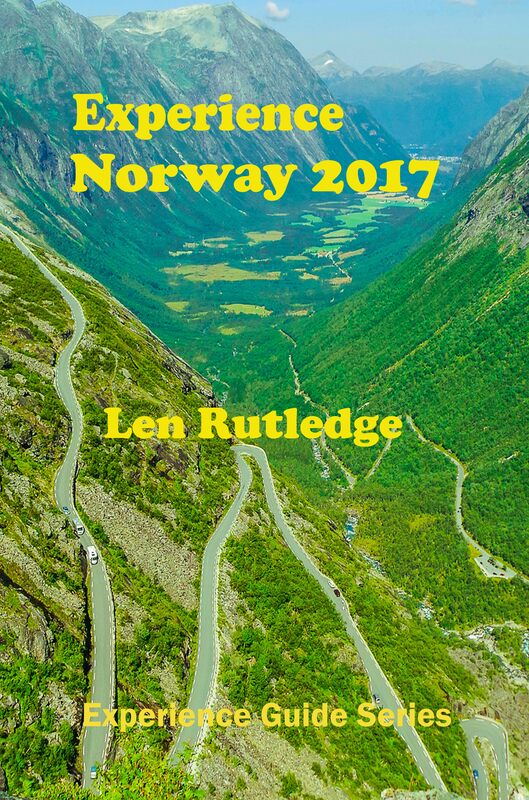 With the addition of nearly 10,000 words, a number of additional images and all new maps this is the perfect book for those thinking of visiting Norway or for those just interested in the country. Frozen, the Disney animated movie that has been a children’s hit in many countries has caused a rise in visitations to Norway. Norway was the principal setting for the movie, and many of the cultural influences in the film come from Norwegian culture. Several major landmarks in Norway appear in the film, including three of my favourites the Akweshus Fortress in Oslo, the Nidaros Cathedral in Trondheim, and Bryggen in Bergen. Numerous other Norwegian attractions are also included in the film, such as stave churches, trolls, Viking ships, clothes, and food. 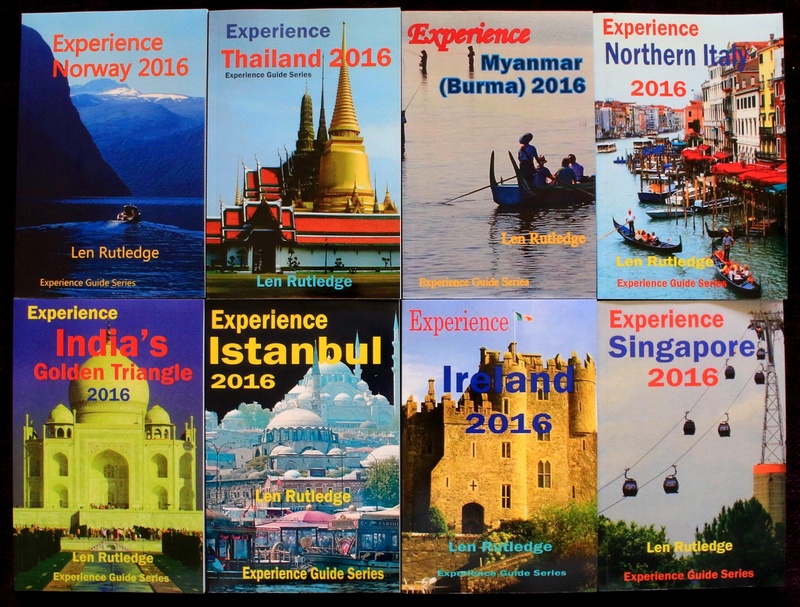 There has also been a spin-off for my book Experience Norway which is now the most popular in the Experience book series. Sales have increased by more than 25% in the past few months due no doubt in part to the movie. Thank you Disney Films! Nearly forty years ago I fell in love. Not with another person but with a city. I was wandering around Europe and had arrived in Bergen. Something captivated me and since then I have been saying that Bergen is my favourite small city in the world. We humans are strange creatures and I resisted returning to Bergen for many years. I guess I was frightened that my memories would be shattered and that Bergen would no longer be special. I should not have worried. When I finally returned I still loved the place and each subsequent visit has reinforced that. Then last year my wife and I spent some wonderful days in Bergen being tourists again. Yes, it has changed but it has not lost its magic. The city with ‘its feet in the sea and its head in the sky’ still has its heart and soul in the right places and its beauty is happily shared with visitors. Ever since Viking King Olav Kyrre sailed into the harbour and founded the city in 1070, Bergen has attracted people from all parts of the world. 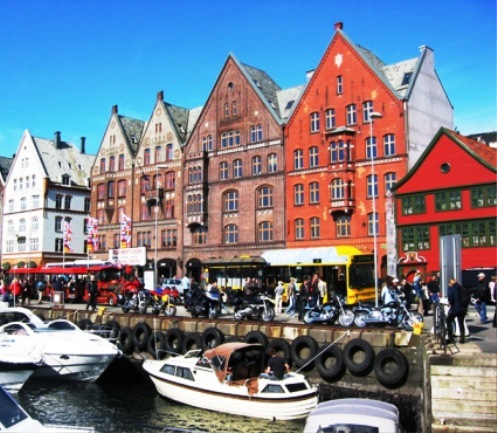 So important was Bergen by the 13th century that the Hansas – the German Medieval guild of merchants – opened one of their four European offices on a wharf called Bryggen. Much from that time has gone but reminders of past centuries remain today. The area has become a symbol of Bergen’s cultural heritage and has gained a place on UNESCO’s World Heritage List. Bergen grew up around its colourful harbour. It is still the heart and soul of the city. Forty years ago it was filled with fishing boats and the fish market on the quay was an exciting, thriving, smelly place just bursting with atmosphere. Now the harbour is thronged with expensive pleasure craft from around the world and the market has a few stalls selling seafood but many more with fruit, vegetables, handicrafts, clothing and souvenirs. It’s different but still spectacular. 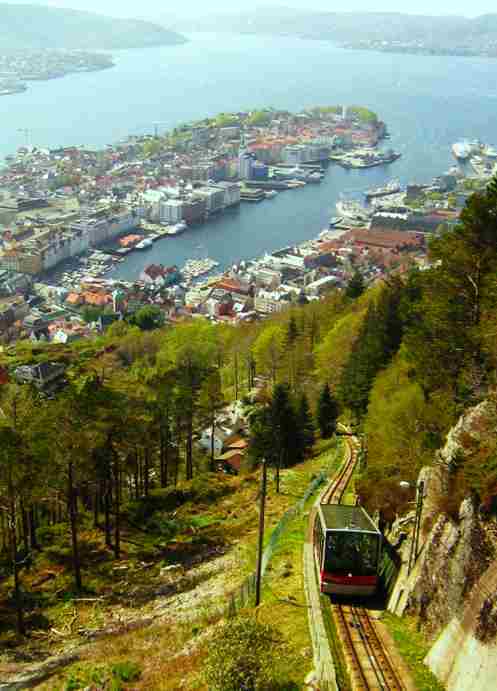 Bergen’s setting – amidst seven hills and sheltered by a series of straggling islands – is brilliant. You see it best from the top of the Floibanen funicular railway. The modern glass funicular goes to the top of Mount Floyen in about seven minutes. At the top you have wonderful views, a fine restaurant, a cafe, souvenir shop, children’s play area and numerous footpaths into the surrounding mountains. If you walk back down the hill you will see some of the charming small wooden houses that are so much part of the city. 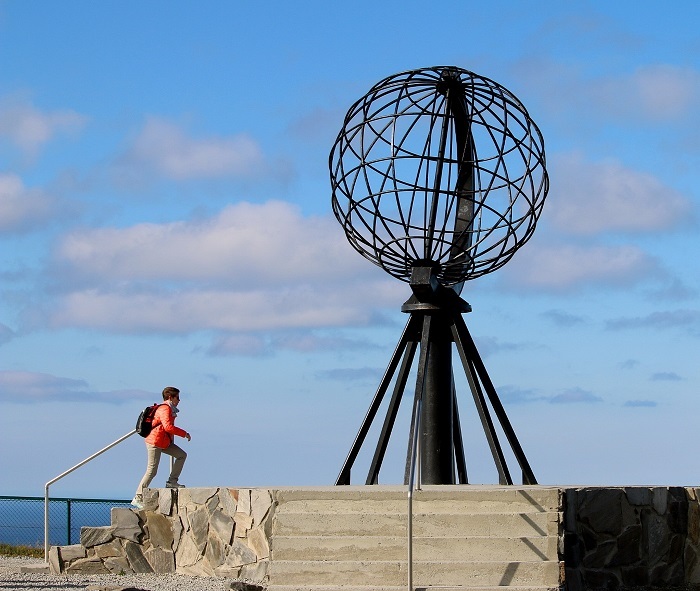 Oslo, Norway’s attractive capital, has many attractions and two outdoor venues are high on the list of things to do. Oslo’s most visited museum attraction is an outdoor sculpture park. The Vigeland Sculpture Park (Tel: 2349 3700; Email: postmottak.vigeland@vigeland.museum.no) covers an area of 80 acres. The 212 remarkable sculptures were all designed by Gustav Vigeland. He also designed the architectural setting and the layout of the grounds. The sculptures are placed on an 850-meter long axis divided into 5 main sections. There is also a Vigeland Museum but this is much less known. The park has sculptures in bronze and granite and several wrought iron gates. Vigeland modelled all his sculptures in full size and the result is stunning. The carving in stone and the casting in bronze were left to a number of talented craftsmen who worked with him. The construction of the park took quite a few years. The area east of the two Frogner ponds was opened to the public in the 1890s. The area west of the ponds was in 1924 given to Vigeland for the construction of the Fountain, the Monolith and the many granite groups at the Monolith plateau. Around 1930 the sculpture park was enlarged eastwards, to include a new bridge decorated with sculptures and a unique main entrance in granite and wrought iron. Unfortunately, Vigeland did not live to see the completed park. The majority of the sculptures and the architectural elements were not installed until about 1950. The municipality of Oslo was the main contributor to the realization of the Vigeland Park. However, a number of private persons and companies gave generous financial support. The result is a park unique in the world. The park is about three kilometers to the northwest of the main center of the city. It is walkable on a nice day but you can also reach here by tram from the central city. You enter through the Main Gate made of wrought iron and granite. Constructed in 1926, it is an impressive feature. This main gate comprises two common gates and five major gates. There are two gatehouses with roofs made of copper. Between the Main Gate and the Fountain, you will find the famous bronze statue of the ‘little angry boy’. This is one of the most popular sculptures in the park and you need to line up to photograph it at busy times. Just after crossing the bridge, you see the Children’s Playground. 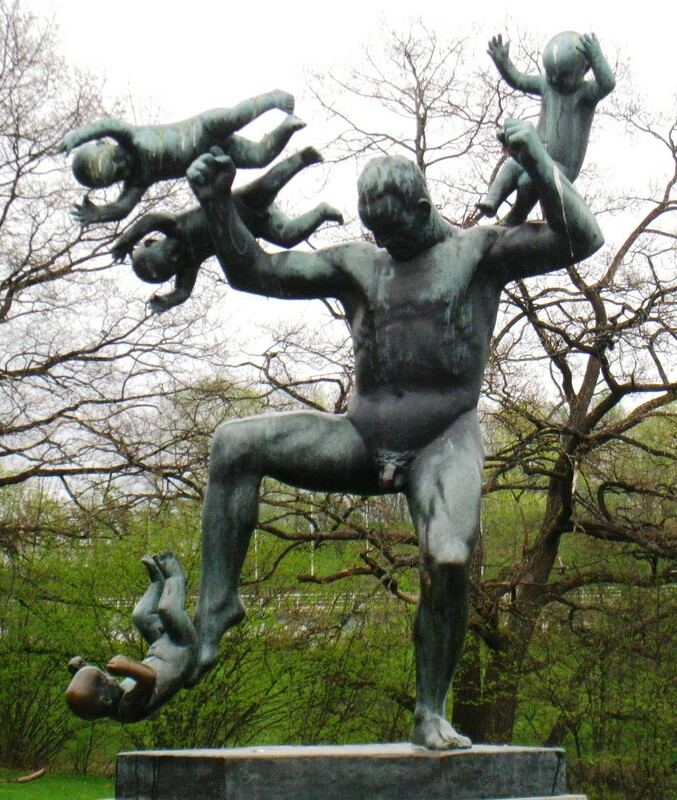 There are eight statues made of bronze showing children at play. Right in the middle of the playground is a granite structure on top of which is the sculpture of a fetus. The area also has a pond where you will probably see some geese and ducks swimming. The Fountain formed out of bronze features 60 separate figurines. The concept of death giving way to a new life is depicted by the several sculptures of skeletons and children in the arms of huge trees. Around the Fountain is a mosaic pattern in white and black granite. 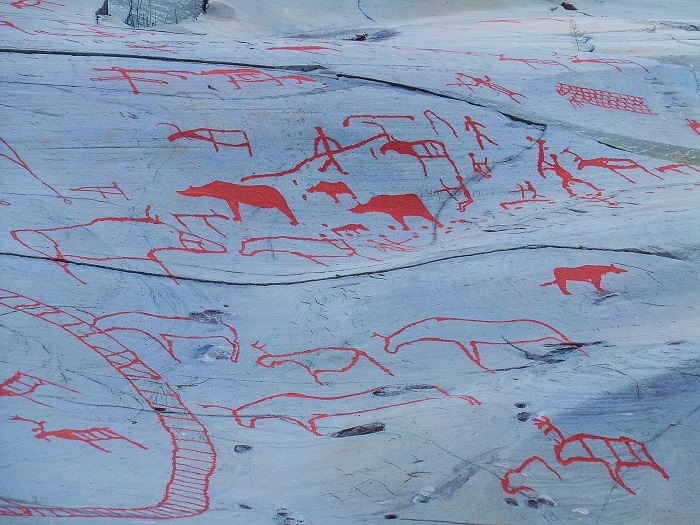 At the Monolith Plateau you will see 36 statues portraying the concept of “circle of life”. There are eight wrought iron gates giving access to the plateau. The Monolith is the highest spot in the park. This towering structure is quite astounding and consists of 121 statues of human beings protruding upwards. I could have spent an hour here just admiring the sculptures and watching the visitors. The Vigeland Museum is a ten-minute walk away. This is the studio of the Norwegian sculptor Gustav Vigeland. In the tower is an urn containing Vigeland’s ashes. 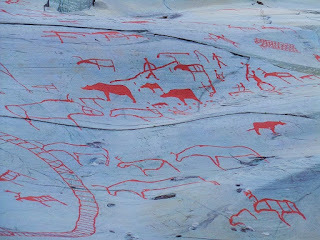 There are nine rooms on the ground floor showing a wide selection of sculptures and certain drawings. Two rooms on the next floor show plastic sketches, drawings and woodcuts. Gustav Vigeland’s flat with two sitting rooms, library and bedroom is on the top floor. One of Norway’s most visited tourist attractions, the Holmenkollen Ski Jump (Tel: 2292 3200; Email: kultur@skiforeningen.no) is only a few kilometers north of the central city. 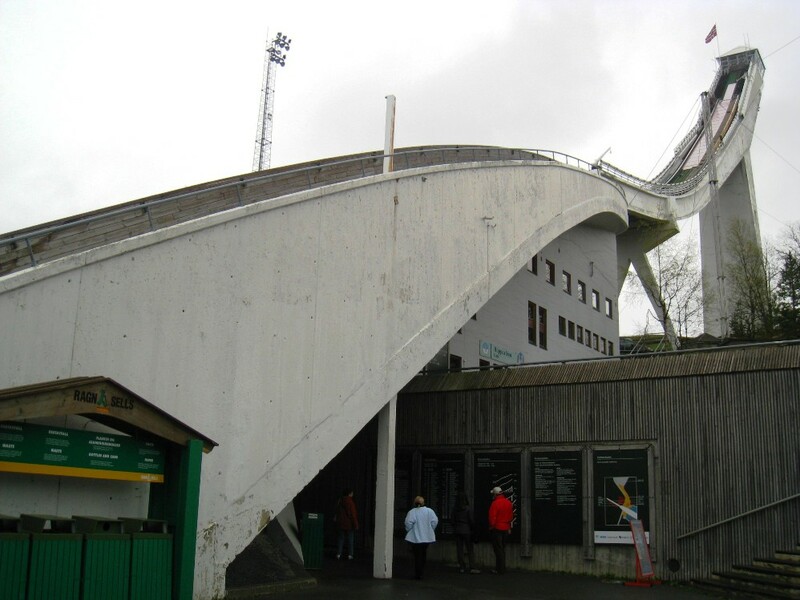 This comprises the Ski Jump Tower with its spectacular views, the world’s oldest ski museum and a ski simulator where you can feel for yourself what it´s like to jump at Holmenkollen or race across county with some of the world’s fastest skiers. 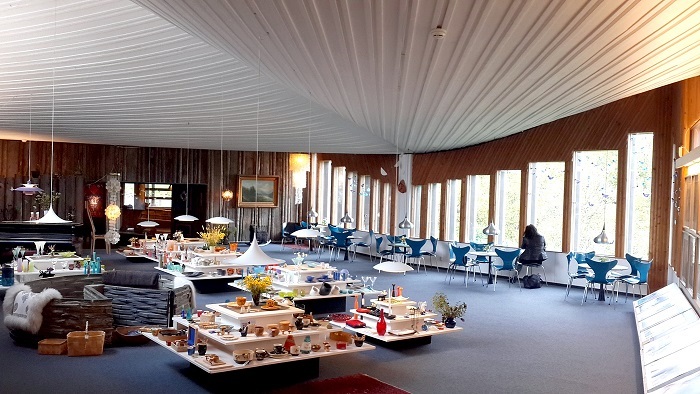 There are also gift and souvenir shops, the Hoppcafè with its special Kollen-cake and a pleasant public area with outdoor service. The information in the Ski Museum is in Norwegian and English. The Holmenkollen ski jump, is host to the world’s second oldest ski jumping competition still in existence (the oldest being hosted by a small, local club named Medicinernes Ski Club in nearby Seterkollen). The first competition in Holmenkollen proper was in 1892. Watched by a crowd of 10,000, the length achieved by the winner, Svein Sollid from Telemak, was 21.5metres. The capacity of the stands has today been increased to over 50,000 people and the jump has been extended 18 times since it was first built. This has allowed longer and longer jump records. Today’s tower extends 60 meters above ground. 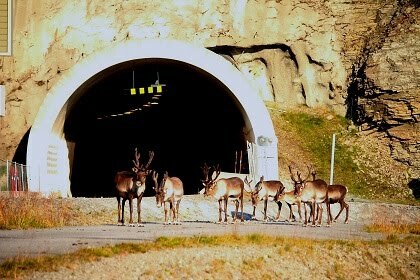 During its time as a ski arena, it has served as host to nine different Nordic skiing and biathlon world championships, including the 1952 Winter Olympics. In 1923, the Holmenkollen Ski Museum, located at the base of the tower, opened. It is the oldest ski museum in the world. Midway down the ski jump, and on the main entrance from the parking area, there is a simulator which allows you to see and feel what the ski jumpers experience. My wife tried this and said it was a great thrill. 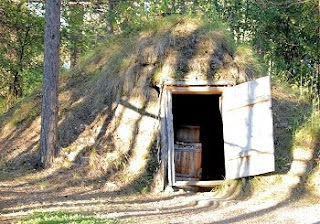 For more information on Norway see Experience Norway an ebook available at www.amazon.com/kindle then search Len Rutledge.